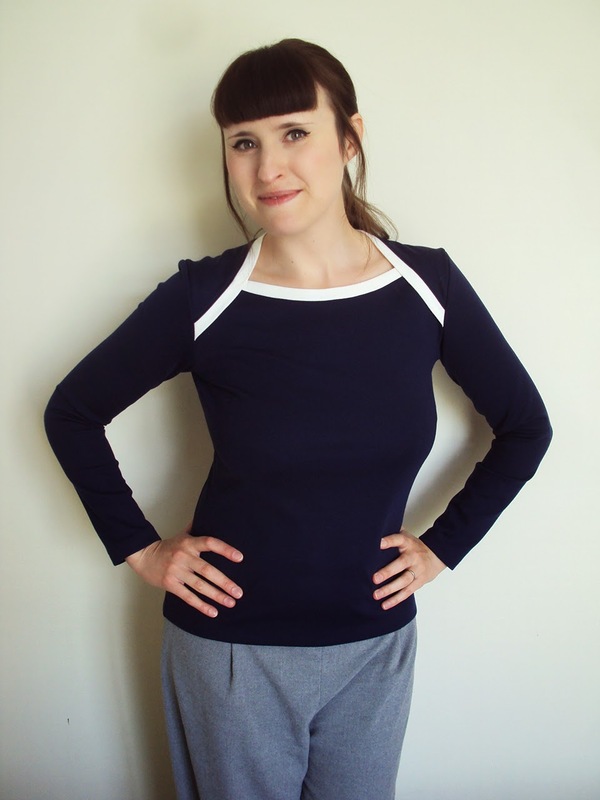 It's the new pattern by Jennifer Lauren Vintage (creator of the Afternoon Blouse): the Bronte top. I was asked by Jen to be a pattern tester and as soon as I saw pictures of her samples I knew it was going to be a hit, both for me personally and for the sewing community in general. It's a genius design: vintage inspired but comfy, the holy grail for many of us sewers, non?! 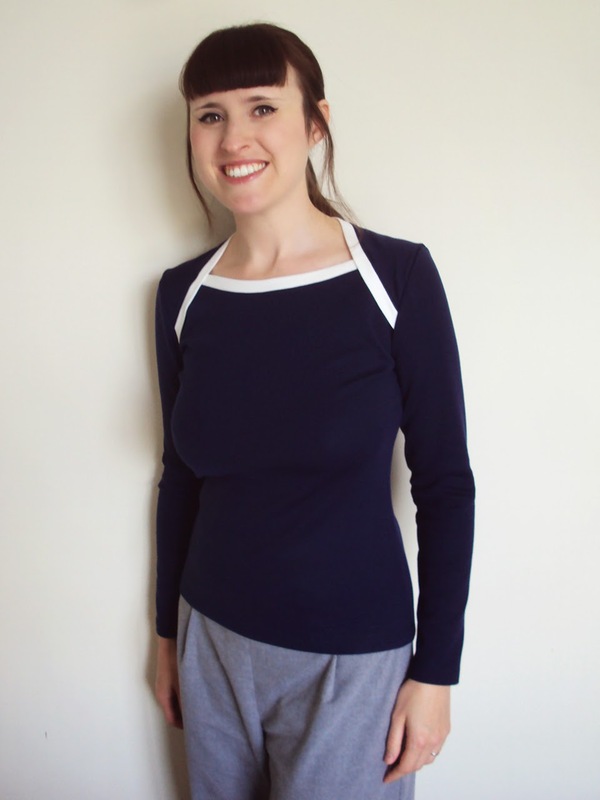 The Bronte top is basically a jersey/knit top with a cleverly drafted neckline that is no more difficult to construct than a t-shirt with a standard bound neckline, and with only one more pattern piece. 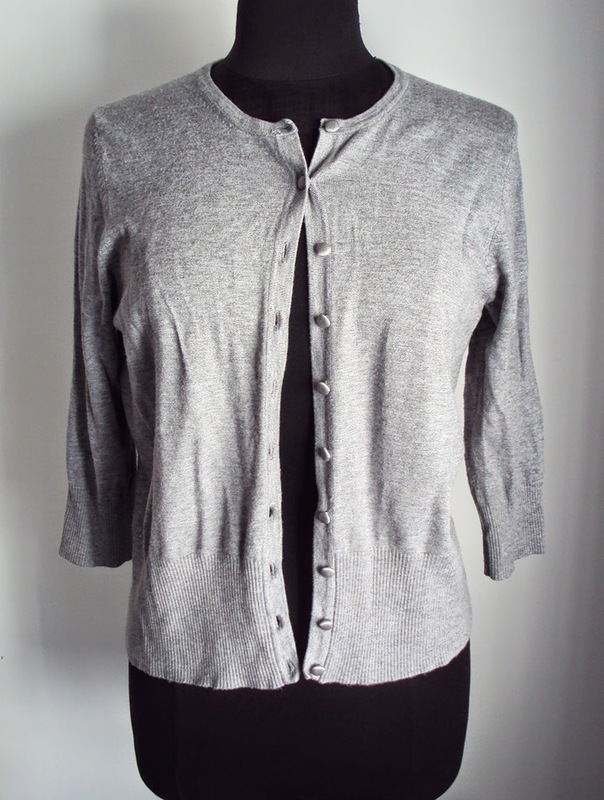 The Bronte's neckline has kind of a flattering 40's vibe but also reminds me slightly of the envelope necklines on babies' onesies (in a good way). I love that you can make it really stand out with contrast binding (as I have done here) and buttons, or make a more subtle effect with self-binding (see Jen's blog post for some great options). I really look forward to seeing how other sewers interpret this pattern. 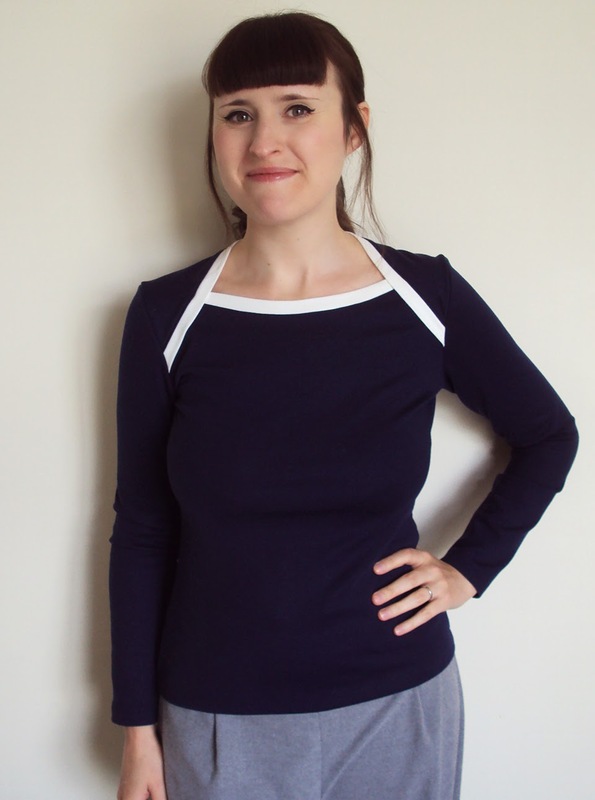 I made mine in some thick, stable navy jersey that was lurking in my stash with cream organic jersey (left over from my Coco breast feeding top) for the binding. 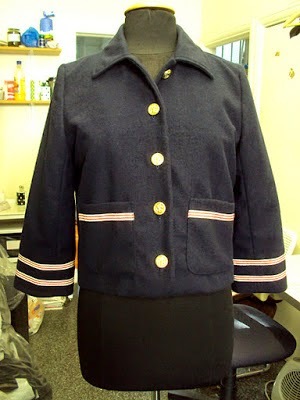 I chose to make the long sleeved option because I felt the thicker fabric suited a colder-weather appropriate version. 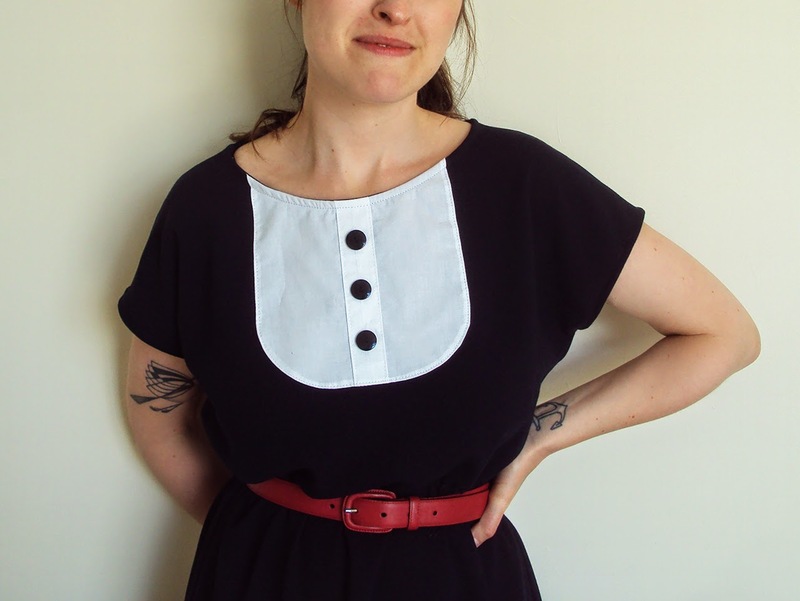 I'd definitely like to make another, possibly in medium weight black jersey with 3/4 sleeves, self-binding and buttons either side of the neckline. You know when you've had a sewing project in your mind for so long that you kind of start to think that it's already been completed? This is one of those. I had the pattern and the fabric for months and whenever I opened Dolores's clothing drawers, I was kind of surprised to find the romper not in there. So last month I eventually got round to making it IRL. I was given this sewing pattern by Jenna (who has recently started up an AWESOME new blog, Just Sew Jenna). Quick backstory: I 'met' Jenna when she was the winner of a giveaway/competition I hosted last year. 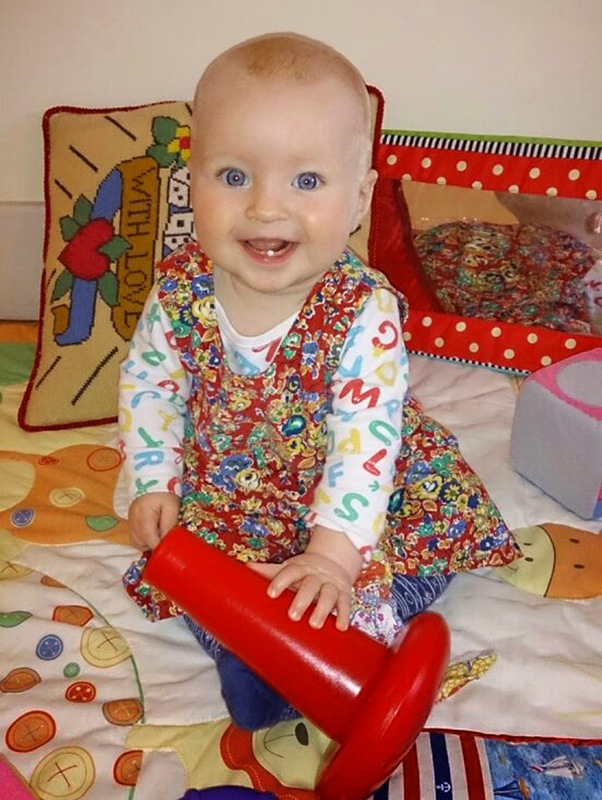 She won 1 metre of her choice of fabric from Sewbox.co.uk. She was sweet enough to indulge my request to see what she made from it (you can see her gorgeous top here) and we've continued to email ever since. She also came to one of the Renfrew t-shirt classes I taught at The Village Haberdashery (the next Renfrew class is on Saturday 2nd August, BTW!) when she made this fabulous garment. Anyways, Jenna is a massive inspiration to me as she sews most of her daughter's clothing herself. 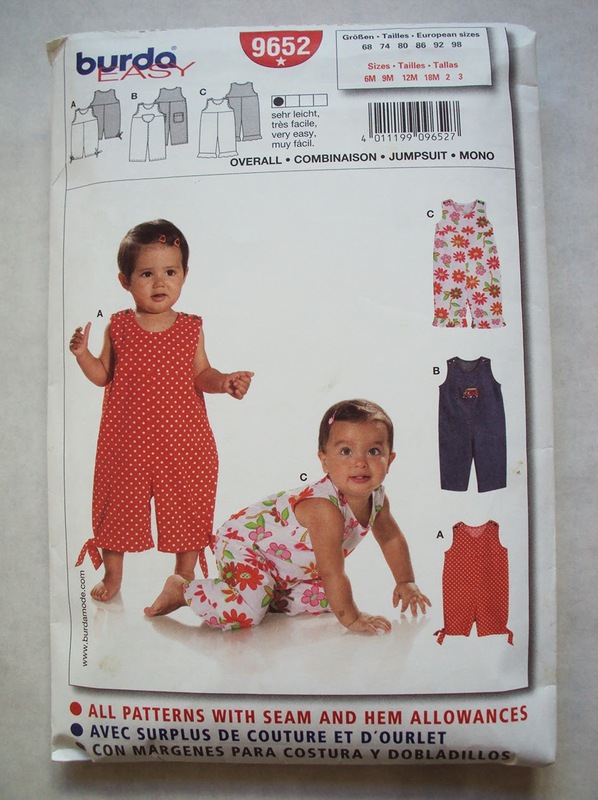 This Burda 9652 romper pattern (pictured below) is one she used regularly when her little girl was littler, and she kindly gave me a spare copy she had. It really is an easy pattern, and a good basis for your own customisation if you so desire. I made view B without the pockets (I felt my fabric would be too busy for the pockets to be noticeable) but I did hack the pattern to include poppers around the inside leg seams for easy access when nappy changing. I eyeballed a hand-me-down romper of Dolores's for how to approach the hack and basically ended up applying a self-bias strip along the inside leg seam to form a base for half of the poppers. The only other change I might make in the future is to elongate the body a bit, as Dolores is a relatively tall and skinny baby (takes after her papa). 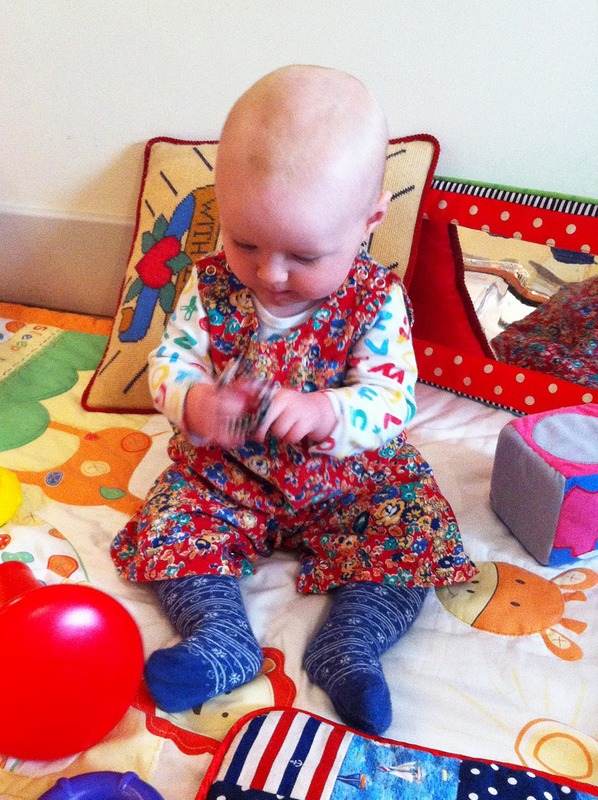 Speaking of Sewbox.co.uk, this super-soft baby cord was a given to me by them. Susan, owner of Sewbox, sent me lots of samples of her impressive array of baby cord and I picked my fave. This is Liberty Kingly Cord - Tatum Trail and you can snaffle your own here. It is an ideal fabric for babies: it's really soft but also holds its shape, AND the garment doesn't need ironing (IMO) after being laundered. 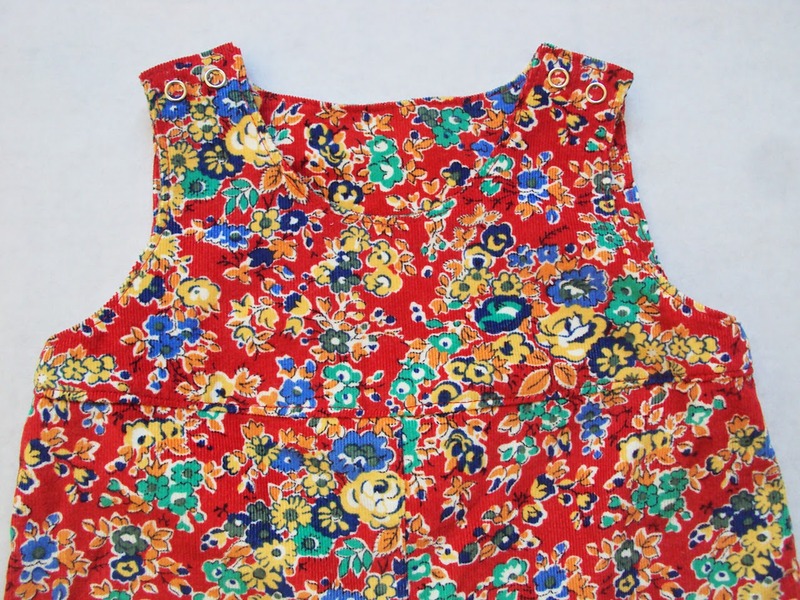 I chose this print because it reminded me of the 70's baby/children's garments that kids were still wearing in my youth (early 80's). It seems, if my explorations on Pinterest are to be believed, a big trend in children's wear is to look as much like mini-adults as possible! This freaks me out somewhat. I love that this garment is firmly a baby's garment. Is isn't close fitting, she can move around in it with ease. She can wear it on its own when its warm, or layered with onesies/vests and tights when it's chilly, and various combinations in-between. With poppers at the shoulder straps rather than buttons, it's a really practical garment that is relatively easy to get on and off, helped in part by its roomy fit. I'll definitely be using this pattern again in the future. How cute is it going to be when she's toddling around in it?! 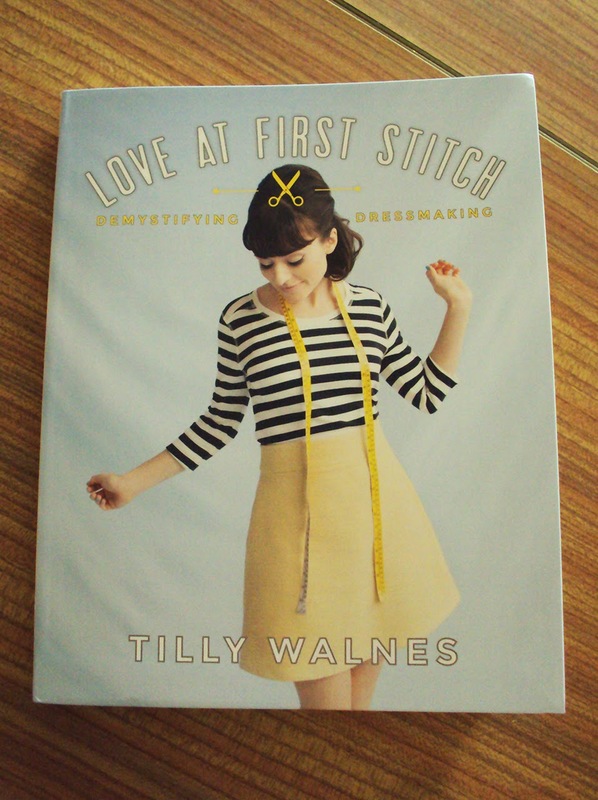 If you're a reader of sewing blogs (and my guess is that you are), it's likely that you are already fully aware that Tilly of Tilly and the Buttons has written a sewing book! However, I've been lucky enough to receive a review copy, and now that MMMay'14 is over and done with I'm damn well going to review it. 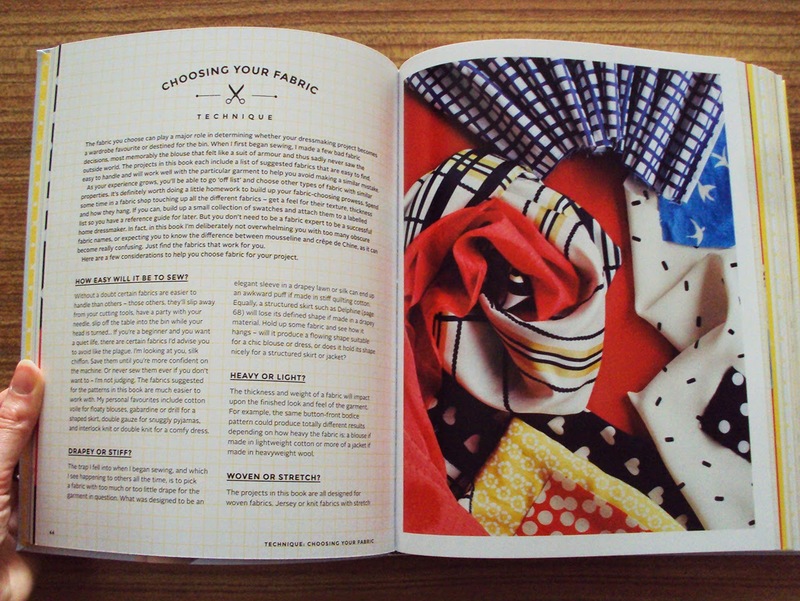 In short, it's a sewing companion that shows you how to make small a range of women's garment projects, and aims to inspire sewing creativity and wearing handmade generally. Aside from the step-by-steps of garment construction, there are all sorts of added extras, like how to plan sewing projects so that they fit with your sense of style and colour palette that really take this up a notch from a lot of sewing books. The design and layout of Tilly's book is truly stunning, and for me it's neck-and-neck with the Built By Wendy sewing books in terms of aesthetics (i.e. the best). 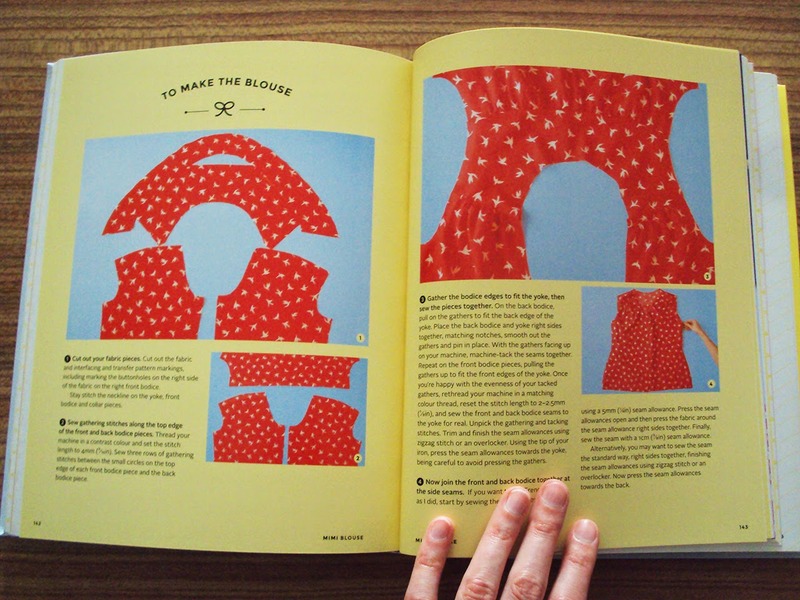 Like the aforementioned Built By Wendy sewing books and the previously reviewed 'Great British Sewing Bee: Sew Your Own Wardrobe' book, 'Love at First Stitch' contains a pattern section at the back that includes full size, multi-sized sewing patterns. 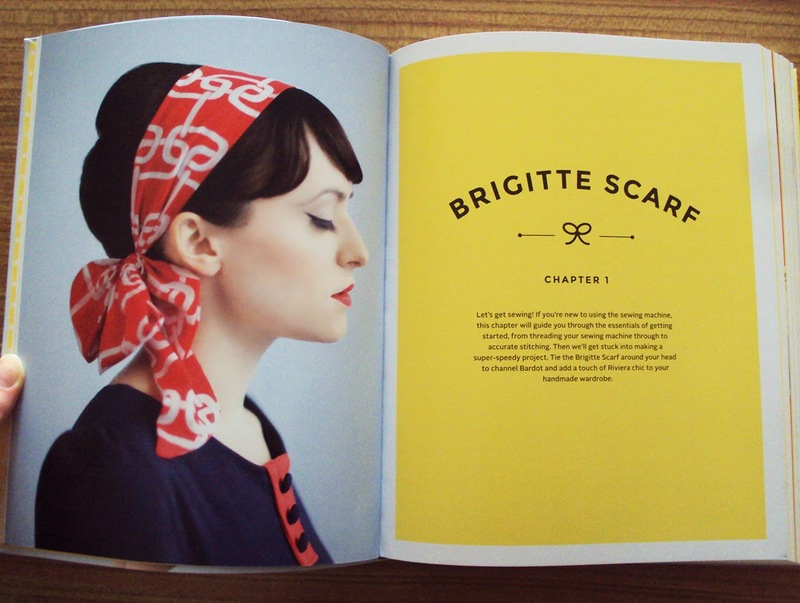 The book talks you through how to create them in a pretty jargon-free and friendly manner, plus 'Love at First Stitch' emphasises ways to customise the patterns to make unique interpretations of your own. It really is a beautiful book as well. So if you have very limited sewing time in your day-to-day life, flicking through this book and stroking the pretty pages when you've collapsed into bed can definitely help you feel like you've interacted with and been nourished by your favourite pastime. For reals. I already use it in the 'stroke the pages having collapsed into bed' capacity (I hope that doesn't sound weird, now that I've written it twice). I also have my eye firmly on the Mimi blouse pattern, once I've got my sewing table clear of the mountain of WIP's currently residing on there. The pyjama pattern also looks like a useful staple that I'll no-doubt bust out at some point. This book is also good to remind myself how vibrant and exciting the handmade revolution that we are all part of really is. Oh, and Tilly mentions in the book about how Me-Made-May is a useful way to start wearing handmade more often, and that makes my heart sing with pride. I know you've been missing Refashion Friday's here on this blog. It's ok, you can admit it. Whether you regard customising as a form of refashioning or not (I do, clearly) here's a reminder that you can jazz up charity shop/thrift store scores with minimal fuss for high impact! 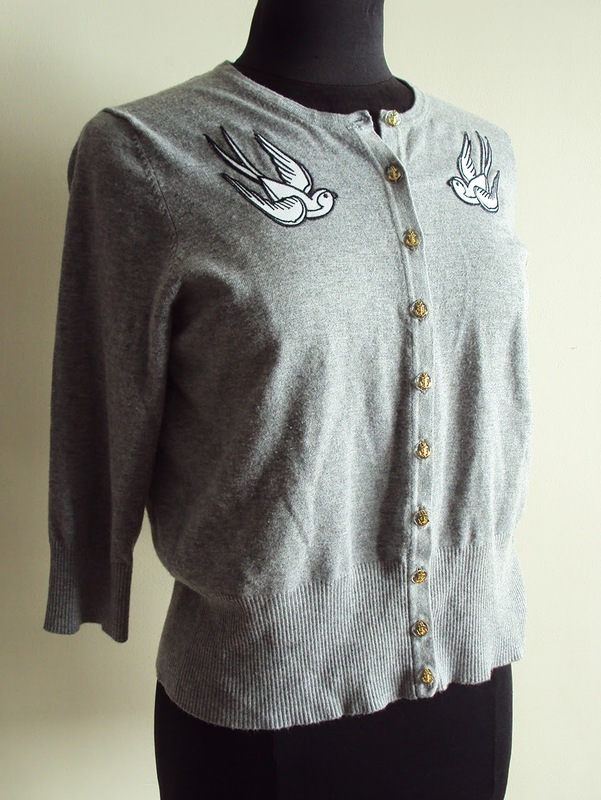 I bought this dove grey cardigan in a charity shop when visiting my in-laws a few months ago. 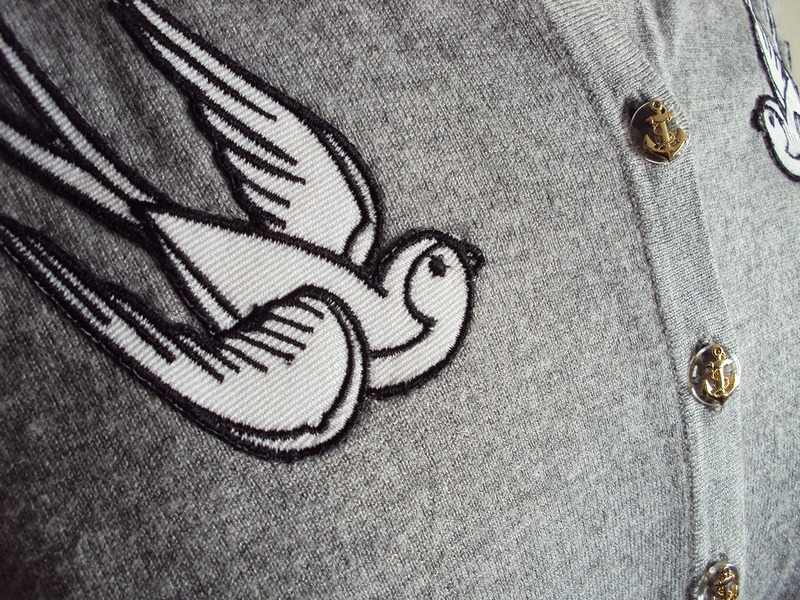 The fit and condition are great, and as useful as a plain grey cardi would probably be, I felt it was a bit too plain. Thanks to MMMay'14, I finally got round to customising and bringing it into regular wardrobe rotation, and it's now one of my very favourite items to wear. 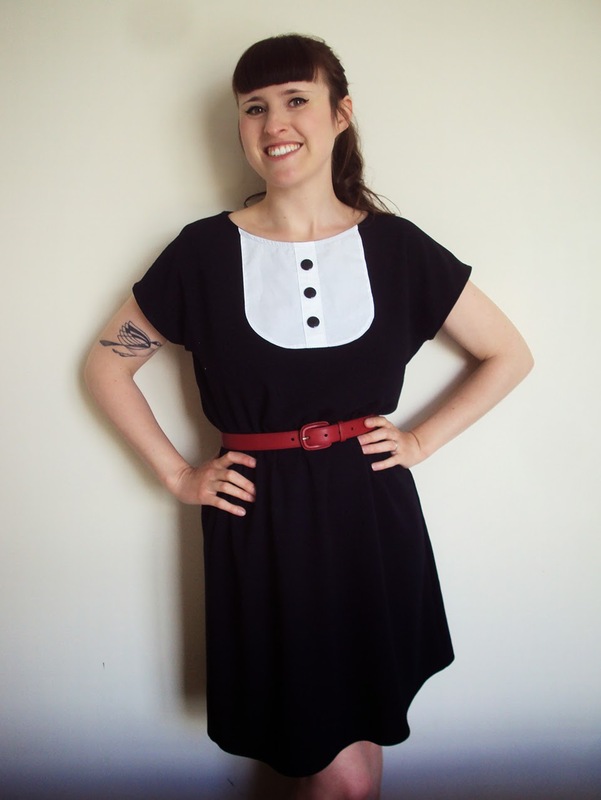 I've long admired the Rockabilly vibes of Collectif Clothing and other retro/repro brands. I love their kitschy 1950's style cardigans, so that is what I've been channeling here. 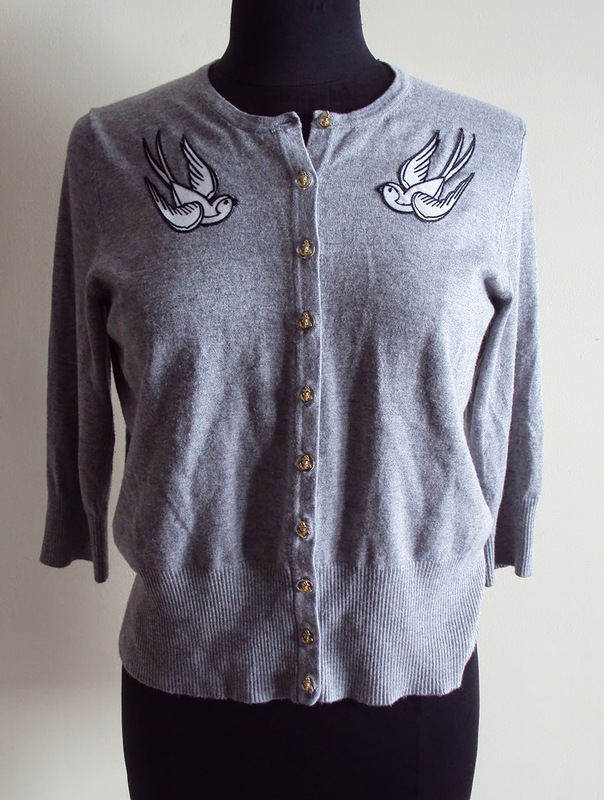 In fact, I've just found this Bluebird cardigan which mine is very similar to mine, except I've got awesome buttons (care of the very lovely Catherine from Clothing and Sewing blog) as well as the swallow decals (which I bought in Madrid, FYI). These buttons are so fantastic, the gold anchors are on a clear base so the background kind of looks invisible. The decals are iron-on, but I carefully stitched round their outer edge as well so they wouldn't start to peel off after a few turns in the washing machine. I am a very lucky girl because someone saw fit to allow me to get involved in the third round of the Perfect Pattern Parcel enterprise. 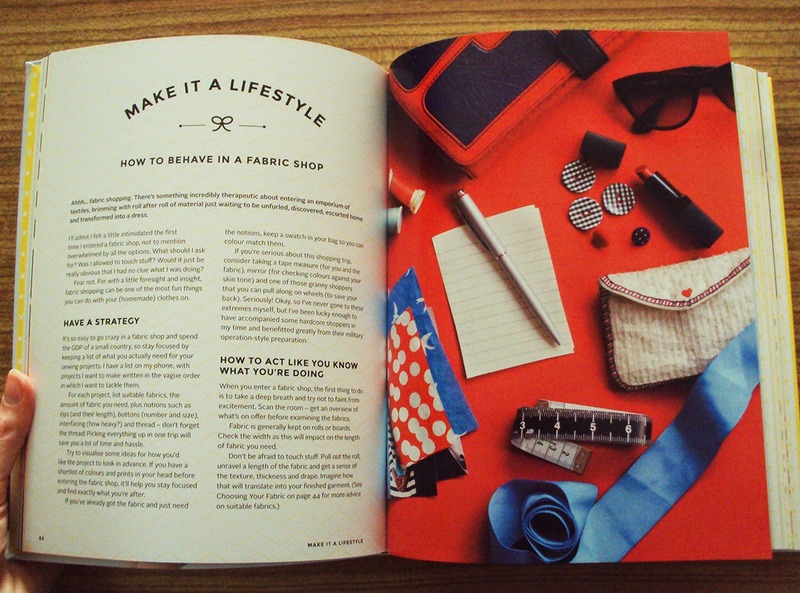 A quick recap about the Perfect Pattern Parcels: the organisers put together a package of PDF sewing patterns along a theme which have been created by indie designers. You can then purchase the pattern parcel for a price of your choice for a limited time only, and then ALL the profits go to supporting a charity called Donors Choose which funds and supports educational projects in the US. The first one I helped to promote was #2, the little girl's pattern parcel. Parcel #3 is a Spring/Summer womenswear set of delights and will be on sale here between 30th May and 13th June. Bonus Pattern: Choose a price of $28 or greater for Parcel #3 and you will automatically also be sent the Bonus Pattern! 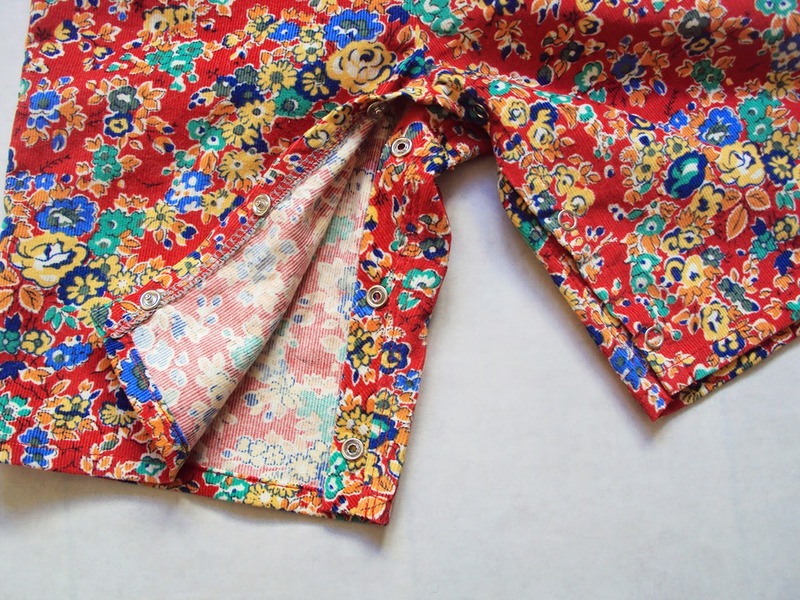 The Bonus Pattern for this Parcel is Prefontaine Shorts for Women by Made with Moxie. This shorts pattern has a retro trim, loads of pockets, two inseams and are so comfortable you won't want to take them off. Includes sizes 0 - 24. Exclusive launch on Pattern Parcel. Be the first to own this pattern! When I first got hold of the selection of patterns in parcel #3, I intended to make the Bombshell swimsuit (or swimming costume as I would call it) by Heather Lou. I've had my eye on that pattern for yonks and yonks (I'd make it in leopard print, and it would be amazing, FYI). But I had to be honest with myself about A) the time I have for sewing projects these days, and B) the lack of cash to splash on the fabric and notions required for a swimming costume project. Plus, I always prefer to make something from fabric I already own than to buy new fabric. So instead of the Bombshell, I chose a quicker make that I could stash-bust the hell out of. The Staple Dress by April Rhodes fit the bill. The Staple dress is a lot like the Anda dress by Burdastyle (remember that?!) but a bit more finessed. A casual semi-fitted style with a gathered waist. It's a great canvas for a great print, however I couldn't find any printed fabric in my stash that was sufficient in quantity for this pattern. I've had this length of navy crepe since I worked in a shonky clothing company in London about seven years ago. It was a sample length that was literally put in the bin (I took it out when no-one was looking). 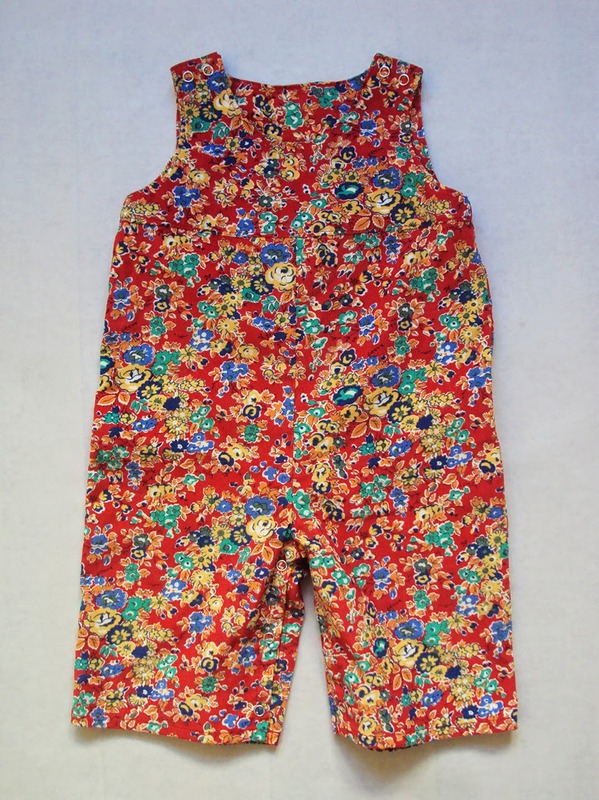 It would be great for a flowy pair of trousers, like my Nautical palazzo pants perhaps, but it wasn't long enough. So although the Staple dress's instructions didn't include crepe in the recommended fabrics list, I thought I'd use it for the project anyway and it's worked really well. When I made the September Tunic/Dress pattern to help promote the #2 Perfect Pattern Parcel, I kept the make pretty simple and true to the basic pattern so people could see clearly what that pattern looked like. 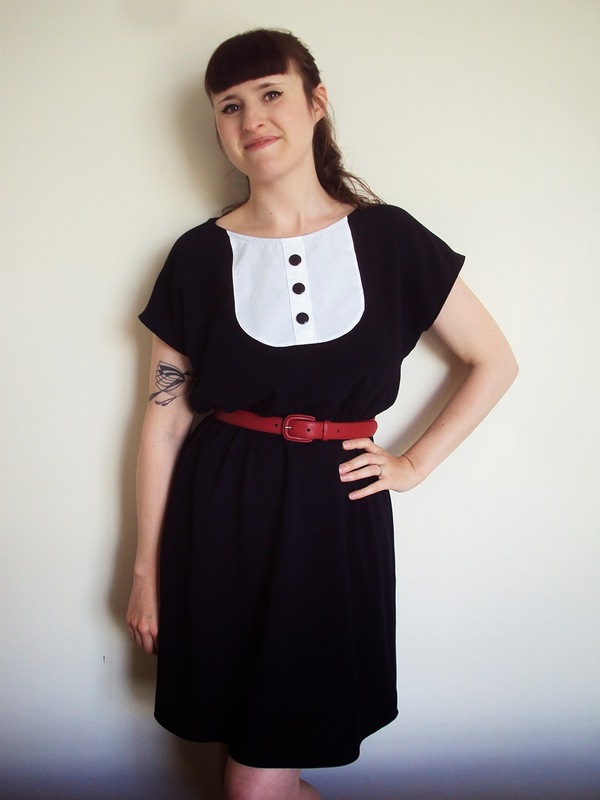 This time I thought a plain navy dress, although potentially classic and timeless, might be a bit boring so why not pimp the pattern with my own twist to show people how they could use the pattern as a template for something different? I hit my 'Modern Garments Sewing Inspiration' Pinterest board for some ideas. At first I though about some kind of ruffle detail, but I thought that might get lost in the dark colour so I opted for a contrast bib/tuxedo detail instead. The bib section itself is made from part of an old bedsheet and the navy plastic buttons also came from my stash so I had to buy nada for this project. WIN! These Perfect Pattern Parcels are a great way to get hold of some excellent indie sewing patterns for far less than the total if you bought them all individually. In fact you can chose you own price depending on how flush you are feeling! What I also like is that, not only do you then own patterns that you know you really like, but also some patterns that might be growers and you may choose to make in the future (which is how I'm feeling about the Poppy Tunic in this #3 parcel actually...). The last parcel sale raised $1800 for the DonorsChoose.org charity, why not head over to the Perfect Pattern Parcel site and bag yourself some great patterns and help them raise even more? Ah, it's always so sad when Me-Made-May comes to an end. The amount of wonderful inspiration and friendly support provided by the other participants is something that can't be beaten, and the rest of the year doesn't feel quite a vibrant by contrast! BUT, there's a whole year of makery ahead that will hopefully be inspired and directed by what we have learnt from this year's challenge, edging us ever closer a wardrobe full of handmade delights that express our personal style, fit with our lifestyle and flatter our physique. I found time to repair my school boy trousers where holes had started to appear through excess wear. I don't think they are very flattering, but I can't deny how useful they are at the moment. At the 11th hour I re-fit my mustard trousers meaning they are firmly back in regular wardrobe rotation. Despite my early misgivings about how much day-to-day use my nautical palazzo pants would receive, this challenge has helped me find what other garments they go with and I now wear them A LOT. I didn't quite achieve my aim of reworking every piece of second hand knitwear that needs work, but I have fingered out which pieces I no longer wear and can therefore be sent for recycling or refashioning into something for Dolores. When I was creating my pledge, I thought I'd be able to use this challenge to get back to wearing clothing that reflects my personal style more than I have been recently. 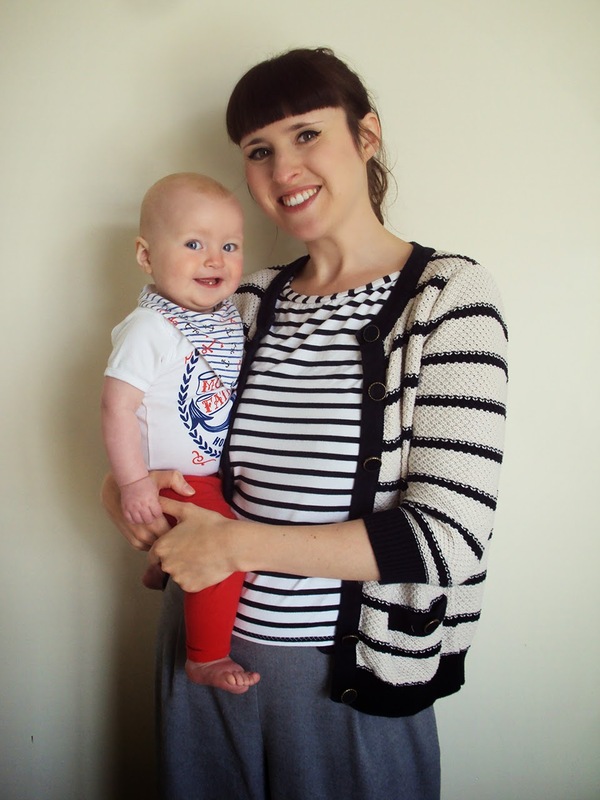 Very soon in to the challenge I realised that the realities of mumming a baby and the practicalities of breast feeding meant that wasn't really going to happen as I had envisaged. I realised how much I'd got into rut in recent months of grabbing the same clothes that I wore the previous day if they were still clean. There's nothing inherently wrong with doing that of course, but as someone who really enjoys clothing and expressing themselves by deciding 'who I was going to be today', it kind of makes me feel pretty far from who I used to be. This challenge made me more mindful of getting dressed, albeit in a limited manner compared to previous years, and helped me shake up my outfits a bit from day to day and I think that I will continue to do so going forward. 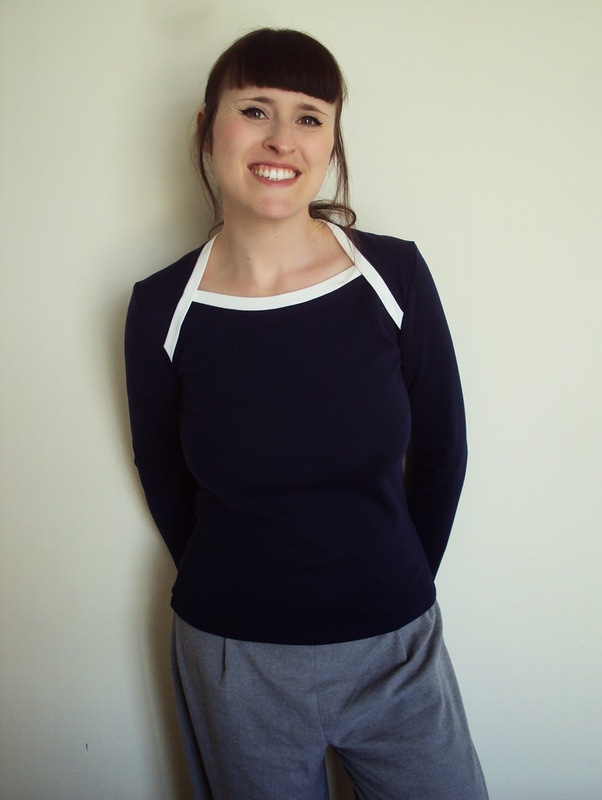 I have a great selection of casual, comfortable me-made clothing. Keeping on top of laundry is a challenge in itself these days, with a baby who is being weened onto solid foods and is going through two or three outfit changes a day, plus no outside space to get clothes dried. However, I have a sufficient quantity of jersey tops and some comfortable trousers and skirts that mix and match well. 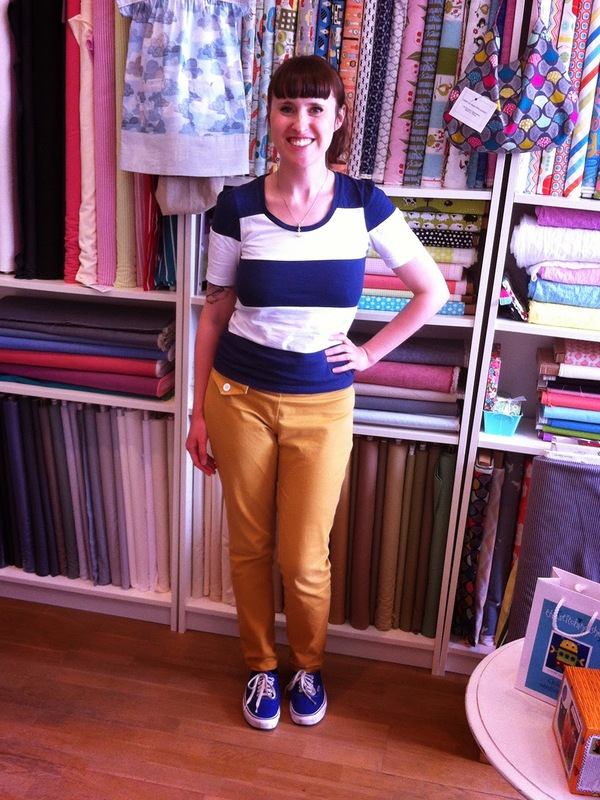 My continuing obsession with navy, red, mustard-yellow, black and grey (plus strips and leopard print!) means that I don't have any clothing orphans and my separates can make a squillion outfits when put in different combinations. This is through luck not planning but I am grateful for it and I hope it continues. The documentation photos of this challenge have helped me highlight a few garments that I realise don't suit me or have seen better days. I plan to refashion/remake these into garments for Dolores or send take them to the textile recycling bank. A few day appropriate dresses would be really nice addition to my wardrobe selection to help me feel a bit more 'put together', but that's something I'll focus on more closely once I have stopped breast feeding during the day. I'd also like to make at least one pair of shorts and maybe a stretchy skirt which I can run after a baby in! Lots of clothes for Dolores! By next year I hope she will be wearing something made by me everyday and join me in each documentation photo. Thank you all so much for checking out my personal challenge and for the lovely and supportive comments you left. If you took part, I hope it was illuminating and fun for you. Here's to #MMMay15!